Female entrepreneurs are launching more businesses, with nonwhite women contributing more than half of that growth last year. The startup rate for women-led businesses has recovered from the recession, and women of color are leading the way. In 2014, women opened the doors of 887 new businesses every day, up from 602 in 2011. Women of color contributed to more than half of that growth last year, opening on average nearly 500 businesses daily, according to the new 2015 State of Women-Owned Businesses Report, prepared with Census data by Womenable, a research organization supporting women's entrepreneurship, and commissioned by American Express OPEN. Overall, the number of women-owned firms has grown by 17 percent between 2007 and 2014, almost triple the rate of growth (7 percent) between 2007 and 2012 at the height of the recession. Since 1997, the number of female-run businesses has grown by 74 percent, well above the national growth rate of 51 percent for all firms. Women now run more than 9.4 million businesses in the United States. 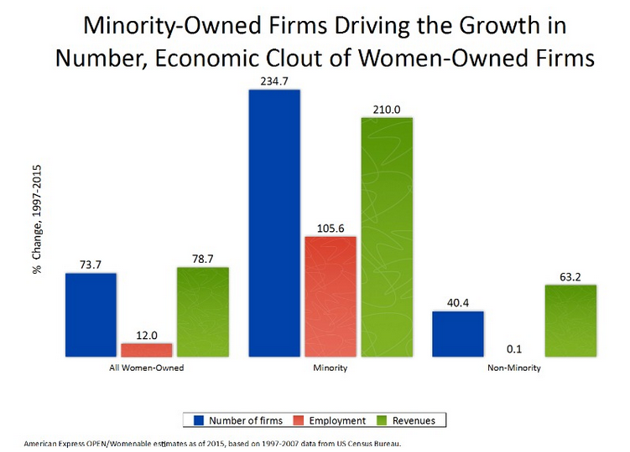 Nonwhite entrepreneurs have been steadily contributing to the growth of women-owned firms over the past two decades. In 1997, they represented one-in-six female entrepreneurs and ran just under 1 million businesses. Today, women of color own more than 3 million businesses across the United States, and one out of every three female entrepreneurs is a woman of color. Their businesses employ 1.6 million workers and generate more than $260 billion in annual revenue. Of those businesses, African-American women own 1.3 million, Latinas 1 million, and Asian women more than 700,000. Asian women report the highest average revenues per firm, ($170,723), followed by Latinas ($68,479), and African-American women ($39,893). Businesses owned by women of color tend to be smaller in terms of their average employment and revenue. But their growth, both in numbers and in their economic clout—the combined average of their growth, revenue, and employment—continues to outpace that of their white peers. That overall business growth for women of color is so high partly because they were starting from a lower base, but the report's authors say their findings demonstrate that "business ownership is an increasing career path for all women." African-American women-owned firms represent the largest share of all women's businesses in Georgia (35 percent), Maryland (33 percent), and Illinois (22 percent). States with the highest share of Latina businesses among women-owned firms are New Mexico (31 percent), Texas (26 percent), and Florida (25 percent). Asian women make up the highest share of women-owned firms in Hawaii (56 percent), California (18 percent), and New Jersey (11 percent).